Laurels are flowering, evergreen shrubs. They are often used as hedges, as the attraction is in the broad, evergreen leaves rather than the somewhat insignificant flowers. Depending on the species, laurels can range in size from a small bush to a towering tree, such as the sweet bay laurel. Many types of laurel are poisonous, according to horticulturists at West Virginia University. For that reason, they should not be grown where livestock graze. This laurel is popular in the southern part of the United States, where it thrives in the full sun common in the region. The cherry laurel prefers moist, rich soil that is well drained. The plant is one of the hardier laurels, but avoid watering it from above nor leave it sitting in standing water. The cherry laurel is very fast-growing and can also tolerate heavy pruning. If left unpruned, this shrub can get up to 20 feet tall and 10 feet wide. The leaves average 5 inches in length, and between 1 to 2 inches wide. The cherry laurel is a spring-blooming shrub, but the white flowers are often hidden behind the broad, leathery leaves. In the fall, the plant produces tiny black berries. This laurel is also called a cherry laurel, but it is most often grown as a wide tree. The plant can get up to 20 feet high with a spread twice as large as its height. For that reason, it is commonly trained to grow on several trunks and used as a privacy screen. The Carolina cherry is very drought tolerant and will thrive in drier soils than the cherry laurel. 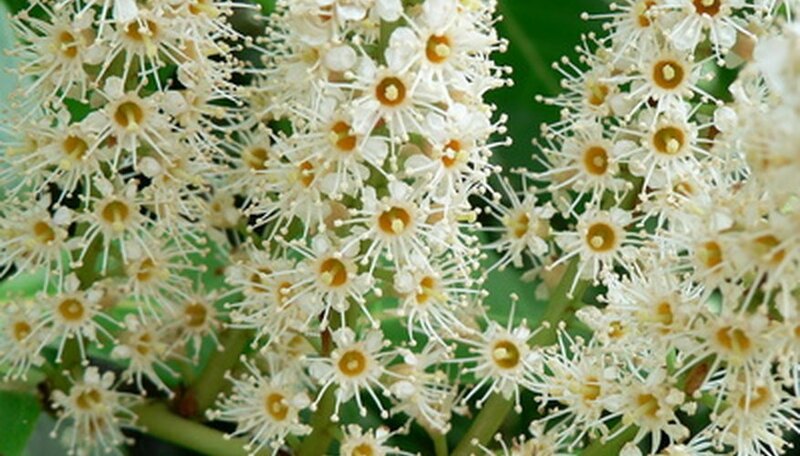 Like the cherry laurel, it blooms in the spring with white flowers that are sometimes hard to see. The Portugal laurel a slow-growing species, but it is also extremely hardy. The dense bush is able to survive wind, pollution and drought. The Portugal laurel can grow up to 30 feet tall and is often trained to grow on one trunk like a tree. This laurel blooms in early summer, with white flowers arranged in spikes that can be as long as 10 inches. The berries are small and range in color from dark purple to bright red. The mountain laurel is native to the United States and has showy flowers, unlike many other laurels. It is a slow-growing shrub that will grow to about 15 feet tall, with an equal spread. This plant grows best on acidic soil, and features white, red or pink flowers, depending on the cultivar. The mountain laurel is commonly found growing in the wild on rocky slopes or along streams. The flowers look similar to those of the rhododendron, and the care requirements are the same as rhododendrons. For those reasons, they are often planted with azaleas and rhododendrons. This laurel is usually grown as a small (maximum height of 12 feet), narrow, evergreen tree. The attractive, dark-green leaves have wavy edges. The flowers are tiny and insignificant. The fragrant leaves of the sweet bay laurel are often dried and used as a spice. Plant this slow-growing laurel in full sun and rich, well-draining soil. How Do I Care for a Bay Laurel Plant?